Petunias are pretty and versatile annuals, used as cut flowers and also extensively in flower beds, window boxes, hanging baskets and other kinds of plant containers. They blossom in a large number of stunning colors and come in many sizes and shapes.Petunias are known as relatively disease-free plants and they do not usually attract insects. 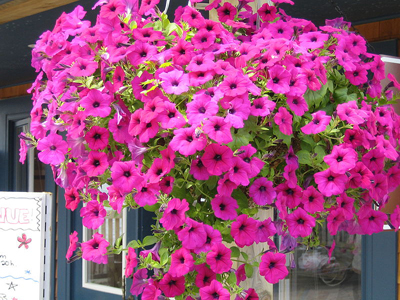 However, there is one condition that often affects petunias and that is damping off. You need to guard your plant from it as this condition can cause serious damage. It rots the seeds during germination and kills the seedlings too. Making sure that your plants get the right amount of moisture and temperature levels, and maintaining excellent sanitation levels at all times are ways to minimize the chances of this disease. When your petunia is attacked by virus diseases, you will see foliage that is deformed as well as stunted. You will also notice light-green streaks on them, with deformed and discolored blooms. There are two ways to control these virus diseases - take out and destroy all the diseased plants, and keep the insects which transmit these viruses away from the plants. Though insects are not generally a problem you encounter while growing petunias, your plants may be attacked by aphids or cutworms. Other common diseases that may affect your petunias are alternaria blight, fusarium wilt, botrytis, crown rot and fasciation. Insects are generally not a problem on petunias. Yellow foliage happens due to iron or nitrogen deficiency can be rectified with supplemental fertilizers. 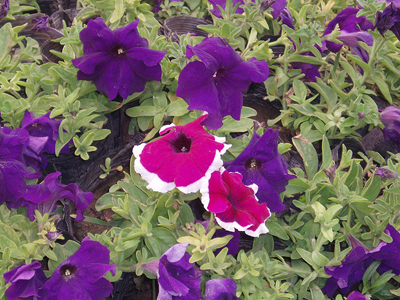 Petunias are very popular spring flowers that go very well with other annuals. You can buy young plants at your local garden centers all through spring. Take home those plants which come with healthy and deep green foliage. More..